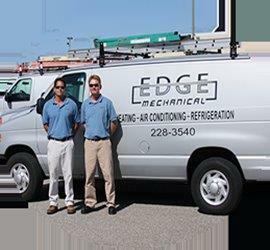 Founded by partners having extensive experience in both installation and repair of HVAC/Refrigeration, Edge Mechanical, Inc. is a family oriented business that has provided exceptional services since the beginning of 2003. Edge Mechanical, Inc. is a licensed Class A contractor serving commercial, industrial and residential clients in all of Hampton Roads and the surrounding areas. Interested in developing valued client relationships, Edge Mechanical, Inc. is a service provider committed to meeting your needs in all aspects of HVAC/Refrigeration installation and service. Our concern for quality workmanship, on-time delivery and total customer satisfaction, are always the driving force behind what we do. Whether it is routine maintenance or a build to spec project, Edge Mechanical, Inc. will handle it with professionalism and quality.